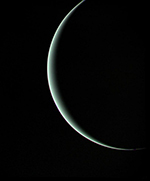 Uranus’s highly tilted axis makes it something of an oddball in our Solar System. The accepted wisdom is that Uranus was knocked on its side by a single large impact, but new research to be presented on Thursday 6th October at the EPSC-DPS Joint Meeting in Nantes rewrites our theories of how Uranus became so tilted and also solves fresh mysteries about the position and orbits of its moons. By using simulations of planetary formation and collisions, it appears that early in its life Uranus experienced a succession of small punches instead of a single knock-out blow. This research has important ramifications on our theories of giant planet formation. Uranus is unusual in that its spin axis is inclined by 98 degrees compared to its orbital plane around the Sun. This is far more pronounced than other planets, such as Jupiter (3 degrees), Earth (23 degrees), or Saturn and Neptune (29 degrees). 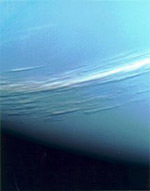 Uranus is, in effect, spinning on its side. The generally accepted theory is that in the past a body a few times more massive than the Earth collided with Uranus, knocking the planet on its side. There is, however, one significant flaw in this notion: the moons of Uranus should have been left orbiting in their original angles, but they too lie at almost exactly 98 degrees. This long-standing mystery has been solved by an international team of scientists led by Alessandro Morbidelli (Observatoire de la Cote d’Azur in Nice, France), who will be presenting his group’s research on Thursday 6th October at the EPSC-DPS Joint Meeting in Nantes, France.